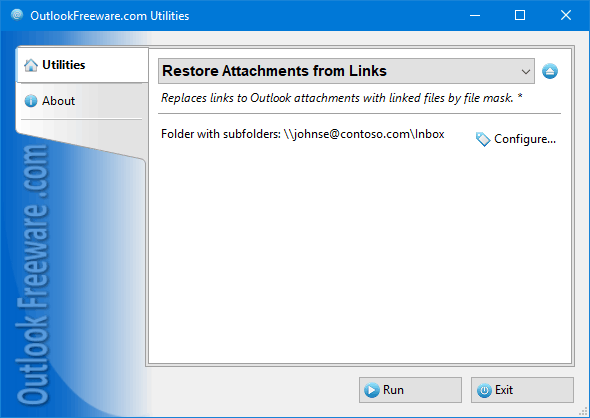 It allows you to restore Outlook attachments securely from links. For example, you need to forward or redirect the message containing the attachment replaced with link. In this case, you can quickly restore the attachment from the link, so the recipient could open it. Most Outlook users make backup copies of their PST data files and mailboxes. If you replace the attachments with links, the backup will save links, not the attachment files. If you want the actual attachments to be stored in a backup, you may need to restore them from links first. The utility allows you to put the attached files back in Outlook quickly and perform the backup losing no attachment data. The utility is easy to install and use. Flexible settings allow you to choose in which types of Outlook items you want to replace links with attachments. You can also use file masks (for example, replace only *.zip files). You can also set the required data rage. This utility is part of a comprehensive solution for saving free space in Outlook mailboxes and data files. Support for command line enables you to restore attachment files to Outlook items centrally, using scripts and batch files.